Purchase a gift card with an initial minimum purchase amount of $5. Gift cards do not expire. Visit or call the locations below to purchase and redeem gift cards. Gift cards will be mailed within 10 days. Visit or call the Customer Service Desk at MPRB Headquarters. Call the Customer Service Desk at MPRB Headquarters to replace the remaining value on a lost, stolen or damaged card with the original purchase receipt. 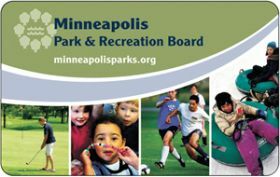 Gift cards cannot be used for private food or boat/bike vendors in Minneapolis parks, youth sports leagues, private golf lessons, parking permits, or off-leash recreation permits. Gift cards are not redeemable for cash or credit, and have no value until purchased. Other exclusions may apply.